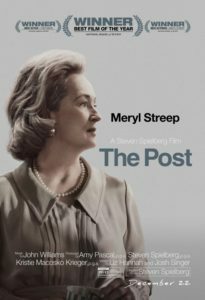 My complete review of The Post is live at the Independent Institute. Advertised as a political thriller, the movie is really an excellent “coming of age” story for the venerable newspaper The Washington Post and its publisher Katherine Graham. Graham inherited the paper when her husband committed suicide in the early 1960’s. She didn’t know much about business or journalism. So, she had to learn on the job. But Graham was reluctant to give up her high-society social life which involved close personal relationships with politicians and White House staff. When the Pentagon Papers were leaked to The New York Times, she had to make a big decision that could put her family’s paper in financial jeopardy. This entry was posted in Film Reviews, Films and tagged film review, Independent Institute, Maryl Streep, movie review, Pentagon Papers, Steven Spielberg, The Post, The Washington Post, Tom Hanks on January 21, 2018 by SR Staley.